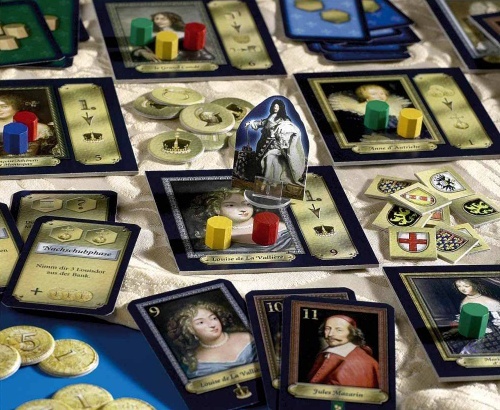 Louis XIV is mostly a worker placement game but it’s quite unusual. First of all, there’s no board; instead, there are 12 mini-boards laid out corner-to-corner in a square grid – this makes it easy to flip over any of the mini-boards but it also leaves spaces where various tokens get placed too. Over 4 rounds, players try to earn as many victory points as possible. Players can earn many VPs by fulfilling their mission cards which are completed by collecting the power chips shown on each card. There are 4 types of power chip as well as one type that counts as any type. Occasionally, a friend of mine runs an all-day boardgames tournament at the games shop (Eclectic Games) in Reading (UK) where anyone can turn up and play. The day consists of around 5 or 6 games each played with 3 or 4 players and the people in each group changes every game so you get to play with most people present. Saturday was the fourth of these tournament days (called BADGER which stands for Berskhire All-Day Gaming Extravaganza in Reading) and I got to play games that were mostly new to me.